Recently the makers of Sculpey Clay sent us some colorful goodies to try out. The kids and I had a ton of fun one rainy afternoon crafting with friends. I'm currently infatuated with all things magical, so I helped my youngest make his very own mermaid necklace. 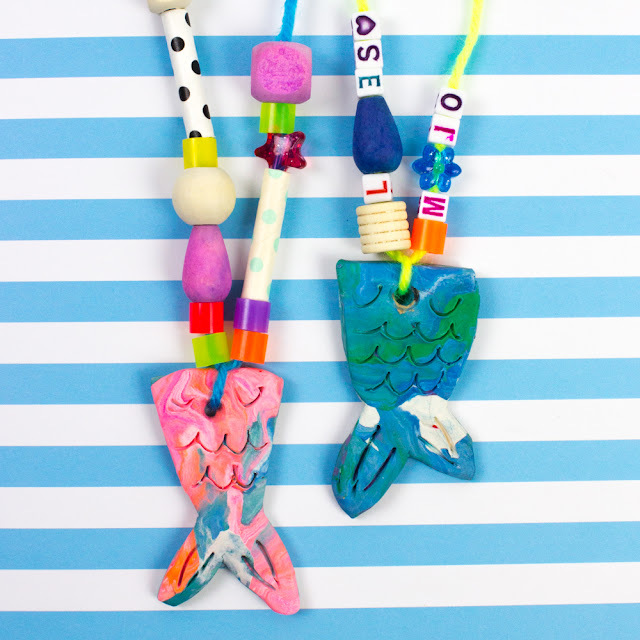 Let's Make Clay Mermaid Tail Necklaces! This post contains Amazon affiliate links. This means I make a small portion off of any purchases made through the links at no additional cost to you. Thank you for the grocery money! For my full disclosure policy, click here. Did you own a best friend necklace as a kid? One of my friends recently bought a pair for her daughter and best friend. (They were groovy mood ones. Girls' jewelry has definitely gotten cuter since I was a kid.) 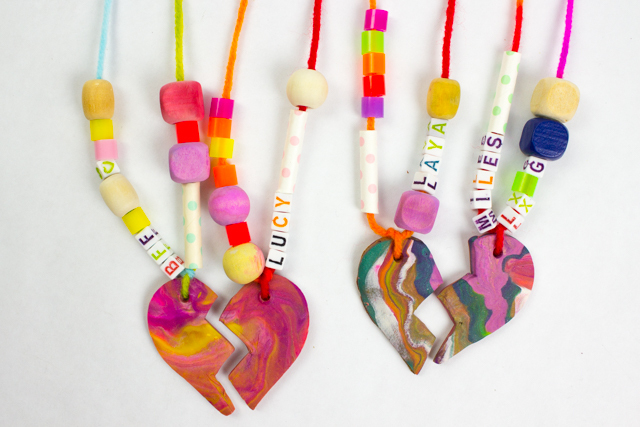 I was so inspired by the cute necklaces that my son and I made our own clay friendship necklaces. Aren't they fun? Note: This post contains affiliate links. This means I make a small bit of change when you purchase items through the links. Thank you for your support and the grocery money! For my full disclosure policy, click here. This post contains affiliate links. Thank you for the grocery money! For my full disclosure policy, click here! Ever swoon while you're walking through stationary stores? I looove pretty pens and paper. But I don't always like the price tag that's associated with them. Since we've been doing tons of clay projects lately, my son and I tried our hand at making clay covered pens. I'll be honest. I wasn't too hopeful about the results. Plastic pens in ovens? Urmm... I worried that they would catch on fire... or melt. But it didn't happen! We turned a couple of el-cheapo-freebie pens into some fancy-shmancy marbled ones. Ooh la la! Aren't they gorgeous? This post contains affiliate links. Thank you for the ice-cream money! For my full disclosure policy, click here! My son started elementary school this week. *Sob* It's been such a happy, bittersweet couple of days. Recently we've been creating a lot of little trinkets with clay. (Have you seen our clay outer space necklace and clay dream catcher?) So I asked him to make some clay portrait pendant necklaces with me before school started. This way I can wear them and remember him while he's away. Here's a lovely clay craft to make with the kids. Lately my son has been having nightmares at night. We've been trying lots of different ways to help him through it. Since we've been doing a lot of clay crafts together, I made him this clay dream catcher to help him have sweet dreams at night. This post contains affiliate links. That means I make a tiny bit from each purchase made through the links. Thank you for the grocery money! For my full disclosure policy, click here. 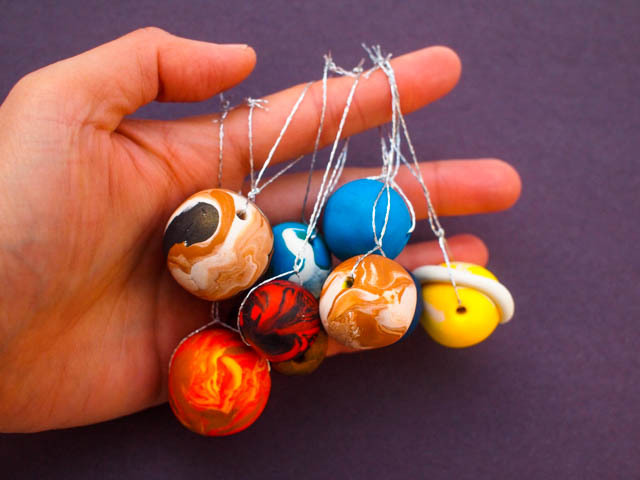 So grab your Sculpey Clay, favorite Magic School Bus books, and visit DIY Candy today to learn how to make your very own spacey clay jewelry! And, if you're looking for more space themed crafts, check out these ideas below! Have you ever tried using air dry clay (affiliate link) before? As someone who really enjoys making paper crafts, it was really fun playing around with this new medium! Last month Chuck and I used it to make some cute flower and star clay ring bowls. I really liked how those bowls turned out, so for this month's Handmade Charlotte contribution, I made these Mosaic Clay Treasure Pots. You can find the full tutorial over there! Have you ever worked with clay? I'm a clay novice and I always get slightly nervous thinking that we need a kiln. But I was totally wrong! There are lots of great, affordable air dry clay options out there. Since my son loves play dough, working with clay has been a really great activity for us to do together. 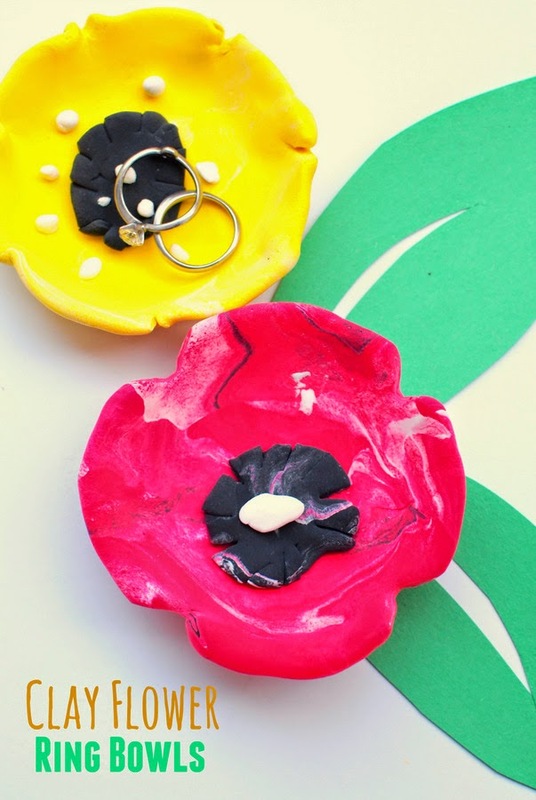 With Mother's Day right around the corner, here are some super easy DIY flower and starry night clay ring bowls that you can whip up with your children!